“You and I have a rendezvous with destiny,” so said the iconic former US president Ronald Reagan. Apparently, the word ‘rendezvous’ is big – especially in the world of music. The novel electropop band Rendezvous promises to be a hit. Their songs hold a strong voice, showing different musical accents while maintaining a uniform impression. Veering away from the messy and cluttered, Rendezvous’ songs of give off clean notes and smart beats. Unlike most electronica bands, Rendezvous manages to stand out by going one step further and giving electropop a fresh jazz groove. So, is Rendezvous an electronica band? Yes and no. Yes, because they craftily manipulate electronic instruments to produce music. No, because they offer so much more than just that. They deserve a multi-classification, a genre of their own, a description with slashes and hyphens. Itai Simon and Hagai Izenberg, the two geniuses behind Rendezvous, hail from Israel and plan to conquer the world of music. A short year after brainstorming and experimenting with different sounds, they released their very first EP. It made quite a splash, attracting the attention of music lovers worldwide. They are now working with music moguls like Dave Bascombe who has teamed up before with the iconic bands Depeche Mode and Tears for Fears. The music world is holding its breath, awaiting Rendezvous’ first electronica album that is a guaranteed smash hit. You can almost picture yourself having a mug of hot latte in your favorite coffee shop, relaxing to their Incognito track, remaining incognito yourself. It’s easy to imagine Marilyn Monroe strutting the streets in her carefree white halter dress, walking to the beat of So What. And if you have any plans of stalking someone, a fitting background song for you would be No Man’s Land. See? Rendezvous carries tunes that tell a story! Hope you found our Ragnarok guides and databases helpful! Ragnarok Quest: Rachel Sanctuary/ Dungeon Quest Secrets Revealed! 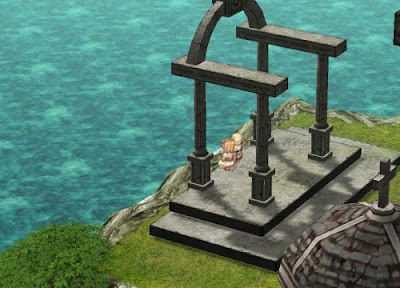 Finally, the Rachel Sanctuary/ Dungeon Quest walkthrough for Ragnarok is revealed! Expect to donate 500M zeny for you to activate the Rachel Sanctuary quest. Talk to Nenma (ra_temple 116 174), then give her 50k, 100k or 150k zeny. For every 50k zeny you give, you will be given one Temple Lottery Ticket. Redemption is done Panno (an NPC) inside the Rachel temple (ra_temin 170 46). When you reach the maximum donation amount, the temple entrance shuts down and you may start with the Rachel Sanctuary/ Dungeon quest. Whether or not your character made a donation wouldn’t matter, as long as the temple entrance is already closed. 1. Have a chat with Nemma (ra_temple 116 174). She will then ask you for help. She’s worried because children are sneaking their way into the Rachel temple. 2. Have a chat with the Kid located by the lake of Rachel (243 37). Chat with him till he talks about fighting priests. Choose the option “Yeah, I love them.” Then, give the kid a candy. He will then share with you the secret to entering the Rachel temple. 4. Begin exploring the temple. If you find this hard, please refer to the map provided below. While going through (que_rachel 94 138), (que_rachel 59 112), and (que_rachel 132 70), you will get a pop-up message that will clue you in. Go to the circled part of the map and investigate the blood stains. Go upstairs to investigate the bloodstains. Once you’re upstairs, look for the checkered floor. You will then find the portal behind a statue. Enter the said portal. 5. As you’re walking up towards the gate, you’ll receive a pop-up message concerning the blood stains. Just investigate till the message says that you have to get out. 6. Return to where you came from. You will then get another pop-up message when you reach que_rachel 165 37, que_rachel 160 37, que_rachel 175 37, que_rachel 170 37, and que_rachel 180 37. Any of these locations will do. Then, go out of the Rachel temple. 7. Upon reaching the exit portal (que_rachel 169 18), either kick or push the door. 8. Have another chat with Nemma. Then, get inside the sanctuary through the door behind Nemma. 9. Get into the Rachel temple and chat with Panno (ra_temin 170 46). Ask Panno, “Hey, did you open the gate?” Then, chat with her again. Panno will share the truth. 10. Chat with Nemma again. She will then ask for a lot of 20 Fire Crackers. Give Nemma the Fire Crackers. She will ask you to talk to some follower in Rachel 11. Find this Seeking Follower in Rachel (142 167). This follower will ask you to seek out the High Priest, Zhed. If the follower says, “May Freya be with you,” this means you have done the Lost Child Quest already. You may then proceed to look for High Priest Zhed. Otherwise, you have to complete the Lost Child Quest. 12. Look for High Priest Zhed (ra_temin 277, 159). From the temple door, walk North East, ground floor. He will give you the experience you need for the Lost Child Quest. Chat with him again till he starts talking about 40 Glacial Hearts. He will also hand you a Letter of Recommendation for the pope. 14. Chat with the Pope (ra_temsky 99 100). She will then ask about you. Answer anything. 15. Return to High Priest Zhed (ra_temin 277 159). He will say he has to chat with someone, thenhe will warp you for you to enter the next room. 16. After being warped, go towards the left wall (ra_temin, 288 158), then eavesdrop on their talk. 17. After the talk, the High Priest Niren should appear. She will ask you regarding Zhed and her relationship with Zhed. 18. Return to High Priest Zhed and talk to him. He will mention that he needs to rest. Walk out and a pop-up message appears: “You have found a key.” Choose “Pick it up.” Then, use the key to enter the evasive Rachel Sanctuary. 19. The entrance to Rachel Sanctuary is in ra_temin (29 312). With the key, open the door. 20. You’re now at the 1st level of the Rachel Sanctuary. Proceed to the 2nd level by using the south portal. 21. On the second level, walk north. Near que_san04 (121, 137), you’ll receive a pop-up message. 22. Just keep walking north. You will get another pop-up message. 23. Keep walking north. High Priest Niren will then show up. She will force you to get out and you will go back to Rachel. 24. Return to High Priest Zhed (ra_temin 277 159). He will ask you to keep things secret about what you saw in the Santuary. Now, you may access the Holy Ground (ra_san). Expect to get 900,000 Base Exp (the previous 200,000 you already got from Nemma) & 600,000 Job Experience. You’re done with the Rachel Sanctuary Quest! You may now enter the Rachel Sanctuary through the bloody gate. In case you forgot, this is located on the 2nd floor. You can enter whenever you need to. The Rachel Sanctuary is great for getting zenies and EXP. Good luck with Ragnarok Rachel Dungeon/ Rachel Sanctuary Quest! Being a super novice has its perks! You’re so cute and cuddly – and you have weapons and equips all your own! Quve Card - Add the chance of auto casting level 1 Increase AGI on Novice or Super Novice when they receive Physical Damage. If the user is equipped with an item compounded to the Lude card, it adds Max SP +60. Lude Card - Has 20% chance of auto casting level 1 Endure on Novice or Super Novice when receiving Physical Damage. If the user is equipped with an item compounded to the Quve card, it adds Max HP +300. Super Novices above LV 90 will be temporarily able to equip ALL Upper/Middle/Lower headgears. Super Novices above LV 90 have 1% chance to 'erase' the death record - which means, the last 1% EXP loss will be recovered. Super Novices above LV 96 will be temporarily able to equip LV 4 Daggers, 1H Swords, Axes, Maces, and Staffs. You cannot change into a Second Job or Transcend. Have the same HP/SP, equipment limitations and attack speed as regular novices. Still receive -1% EXP penalty upon death. Play Dead skill can no longer be used (once you become a Super Novice). Cannot equip bows and two-handed swords; therefore, they can never get Double-Strafe and the Two-Hand Mastery skills. The secret revealed! How to summon your guardian angel in Ragnarok! Ragnarok gamers have been wondering about how to summon their guardian angel. Want your Ragnarok characters featured in this blog? Join our Best Ragnarok Screenshot contest! A fresh screenshot of your Ragnarok character may be featured in this blog! 1. Make sure your Ragnarok character is in the screenshot. Verify this by entering "GamerGroundz Screenshot" onto the message field (where you type your messages to fellow Ragna players) before taking a screenshot. 2. You may submit as many screenshots as you want. However, submission of one screenshot repeatedly is not allowed. Your entries will be disqualified if you submit one screenshot more than once. 3. You may edit your screenshots as long as they don’t look “too photoshopped.” Please indicate if your shot has been edited in any way. This will not mean that you are disqualified; however, we want the best screenshots to be as “real” as possible. However, if your entry does get chosen, your screenshot may be cropped or edited as needed. It's easy, right? So what are you waiting for? Deck your character up by wearing your best equips! Take screenshots when you go to beautiful maps! We will feature the five best screenshots. Hurry, submit your entries now! Send your entries to gurlfever@rocketmail.com. Make sure to write "screenshot contest" in the subject field so that your email doesn't go to junk mail. Don't forget to provide the information requested above in your email. NO ZIPPED FILES ALLOWED; only JPEG files are accepted. Go from swordman to KNIGHT in just three days! First, get your basic skills up to lvl9. Then, go to Izlude and change your job at the swordman hall. Once you’re a swordman, buy yourself a basic sword. It costs around 100z- 600z – really cheap! However, it doesn’t have a good attack power. Still, it will be very useful. Then, go kill some porings until you have enough money to buy 150 red potions. You will need these red potions when you go down to Prontera, then go east, to arrive at Poporing land. Kill the poporings - but be careful! Don’t die just yet; use your red potions. DO this till you reach lvl 25. Once you get to lvl 25, go to the Ant Hill. Do some quick killing, which is really easy there. Stay there till you’re at lvl 32. Upon reaching lvl 32, kill pecopecos. Do this till you reach lvl 37. Then, go to Payon. You can get warped to Payon from a kafra. Once at Payon, go east twice. You'll then encounter smokies – kill them and use bash if you have to. Do this till you are at lvl 40. When you are at lvl 40, go to Al de Baran. Ask a priest or acolyte to warp you - or go to a kafra to get warped there. In Al de Baran, go to the Toy Factory. Kill the Cookies and Xmas-cookies till you reach lvl 51. Here’s the easy part: leave Al de Baran and go to Orc Dungeon. Kill all the orc zombies and skeletons you encounter. You will soon reach lvl 54 and job lvl 40. If you want to reach job lvl 50, stay in the Orc Dungeon till you are at lvl 59. Once you accomplish this, go back to the Toy Factory,second lvl. Kill the cruisers and mystcases; this will get you up to lvl 63 & job lvl 50 in just 3 hours. This is important! Do this in the right order – don’t mess it up! Good Luck! Soon, you get the job change you need from swordman to knight. Here you go, a map of Ragnarok, also known as the map of Rune- Midgard Kingdom! If you need the larger copy, just click on the pic. You can change jobs to a Merchant in the Port City of Alberta. Talk to the guildsman in the Merchant Guild, located in the 7 o'clock direction of the town. The test consists of delivering an item, just like any other Merchant would do. In the room next to the guildsman, deliver the box you get to the specified city and person. Once you successfully deliver the box, you will receive a receipt. The test is completed and you will be turned into a Merchant once you return the receipt to the Merchant Guild. Requirements are Job Lv 10. This is the Merchant Guild. the item to be delivered. After getting a receipt, give it to the Guildsman and you will be able to become a Merchant. Wondering about the skills of this character? Here is an extensive summary about all the skills this Ragnarok job has. learned after Job Lv.35 by completing a quest. Inflict Neutral property splash damage to all enemies in a 9 cell area around a target. Each cast consumes 12 SP and requires the caster to equip a Pushcart. Cart Revolution inflicts an amount of damage equal to 150% of caster`s normal attack added to the weight of items carried in the Pushcart. The target hit by this skill is forced 2 cells backward. learned after Job Lv.30 by completing a quest. Change Cart enables Merchant Class characters to change their Pushcart`s appearance. Higher leveled characters will have access to a greater variety of Pushcart looks. If the skill is cast before a Pushcart is equipped, the new Pushcart appearance becomes active once the Pushcart is equipped. When a Pushcart is removed and re-equipped, it will return to its default appearance. Each cast consumes 40 SP. learned after Job Lv.15 by completing a quest. Consume 8 SP to add 4 STR for Crazy Uproars`s 5 minute duration. This skill is mastered at Lv.10. Enables character to purchase items from NPC shops at lower prices. This skill`s` level affects the amount of discounted zeny. Basic Merchant skill mastered at Lv.10. Permanently increase the character`s maximum Weight Limit. Basic merchant skill mastered at Lv.1. without using Magnifiers. Each cast consumes 10 SP. Inflict great damage on an enemy by spending zeny. The amount of zeny consumed by Mammonite is affected by the skill`s level, although Mammonite always consumes 5 SP regardless of skill level. Overcharge increases the amount of zeny received by the character when items are sold to NPC shops. Normally, characters receive 50% of an item`s NPC sale price when an item is sold to an NPC shop, but characters that have learned Overcharge can receive more zeny from sales to NPC shops. Prerequisite: Enlarge Weight Limit Lv.5. Enables the character to rent a Pushcart from most Kafra Employees. Pushcarts have an 8000 maximum Weight capacity and have 100 inventory slots. Each piece of equipment occupies 1 inventory slot, and all other items can be grouped into the same inventory slot if they are identical. Characters equipped with Pushcarts have decreased Movement Speed which can be recovered by mastering this Pushcart skill. Enables Merchant class characters to open shops if they have equipped a Pushcart. Only items inside the Pushcart Inventory can be sold through Vending, and the maximum price for vended items is 10,000,000 zeny. Merchants with Lv.1 Vending can only vend 3 items at once, but increasing this skill`s level will also increase the maximum amount of concurrently vended items. Each cast consumes 30 SP regardless of skill level. To see the comprehensive skill tree of this Ragnarok job, please click here. How to become a knight, mage, priest, etc. Subscribe to our posts (Posts RSS) by clicking here! GamerGroundz is a top blog! Adrian is a teen gamer with extensive insight and experience in different gaming platforms such as World of Warcraft, Ragnarok, and Final Fantasy. He is currently taking up an Engineering major. Adrian aims to share free game cheats and free game walkthroughs through GamerGroundz. As he always says, "Life is a game; learn to play it."